Hey there... Happy Friday! Yesterday got away from me between a Bring Your Own Device training at work (yes, kids can bring their own electronics to school now for school purposes), a stop at the scrapbook store again (Shhh!!! Don't tell anyone) and a stamp class at my friend Lisa's house! Speaking of the stamp store, while there, someone asked me if I was Pam. I looked up (I was bent over) and said, "yes I am". LOL It was one of my blog readers and fellow stampers Donna! Nice to see you again Donna! Thanks for letting me know you read my blog. As a blog writer, sometimes it is hard if you don't know if anyone reads your stuff! Well, Donna does and that makes me SO HAPPY! Back to cards... If you don't know by now, Marc and I have a cocker spaniel that we adopted from the Humane Society. His name is Arnie Ray and he is probably about 6 years old now (I got him in 2011). This adorable set is one of my favorites from the new catalog because the little dog looks like Arnie! 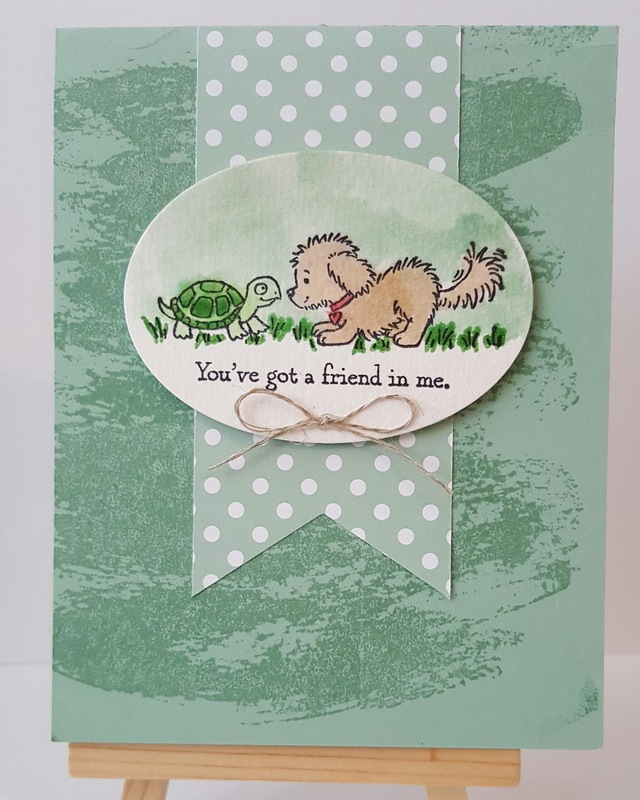 I used the Watercolor Wash Background with Mint Macaron ink, the same color Designer Series Paper Stack and watercolor paper. 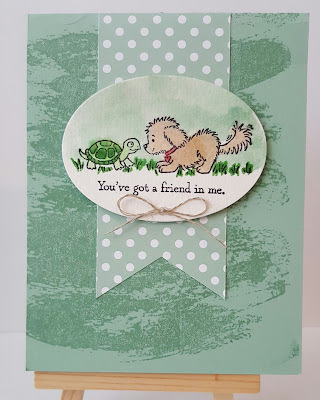 I used some of the other inks to color the puppy and turtle using the Aqua Painter Pens. As with everything else I have been playing with lately, I look forward to showing you more with this set! Wait until I get the new Kitty set to show you, it coordinates perfectly with this set! Do you have a huge Wish List? You can join right now (until June 30th) for $99 - get $125 in products (your choice) PLUS you will get TWO Stamp Sets of your choice of any value! This is a great value and will help you to grow your stamping supplies. There is NO commitment to buy anything further and you will receive the 20% off future orders until October 31st! Only 6 more days to get the extra 2 stamp sets!